California is pushing to exit the union. But how easy is it going to be? Amidst fear and anxiety sweeping America in the aftermath of Donald Trump's presidential victory, the Yes California Independence Campaign, has acquired a new momentum. Not surprisingly, alarm bells have begun ringing in the state which, according to its Public Policy Institute, is home to more than 10 million immigrants, and almost 27% of them undocumented. Side by side, with an increasingly visible debate around California's exit from the Union, has also come up the demand to declare California University campuses "sanctuaries" for undocumented immigrant students. An array of newspapers from the Los Angeles Times to New York Times, have picked up the strains of this debate, which though not novel, is gaining new votaries in this liberal swath of America. Social media is awash with Californians pitching for secession in light of the new political circumstances. Consider for instance the new set of progressive laws that Californians have backed in the latest round of elections. An overwhelming majority have voted for legalising marijuana, and to end restrictions on bilingual education in public schools. The votes indicate the desire for Californians to deepen the roots of the state's diverse culture and not end it. For example, in an article in the New York Times (10 November) titled California Today: Secessionist Groups Seize the Moment, Mike McPhate wrote: "For one group, the post-election reaction has been electrifying. Yes California, a grass-roots organisation with 3,000 or so supporters, has for years been trying to persuade Californians to take up the cause of secession. 'We hit it big with Trump being elected,' Marcus Ruiz Evans, a spokesman, said on Wednesday." Or consider what Timothy William Waters, a professor at Indiana University Maurer School of Law, wrote in an op-ed in LA Times on 16 November: "Independence would be painful. Going it alone is risky - just ask the Brits - and Canadians know you don't escape the shadow of your giant neighbour by drawing a border. Unstitching California's economy from the United States' would damage both because California isn't actually an island. But while those might be reasons to vote against secession, they aren't reasons not to vote." Nobody - not even the secession votaries - argue that the exit route would be simple. Even if such a demand secured formal state approval, to exit, California would require two-thirds approval of both the House and the Senate, in addition to, endorsement from 38 state legislatures. As of now, no protocol exists to guide a nation to exit. Yet desperate times ignite dormant, even if extravagant, dreams. Following Donald Trump's victory earlier this month, the Yes California Independence Campaign said it is planning a referendum in 2018. Melia Robinson in the Business Insider wrote, "...if passed, would bring California one step closer to becoming an independent country." The Yes Campaign has picked up an impressive votary in Shervin Pishevar, a reputed angel investor, offering to bankroll the exit campaign. In a statement, the campaigners have argued, "As the sixth-largest economy in the world, California is more economically powerful than France and has a population larger than Poland. Point by point, California compares and competes with countries, not just the 49 other states." Louis Marinelli, president of the organisation, believes like Scotland in the United Kingdom, California, too, could function like a sovereign entity within the US. But the question of secession hinges on the constitutionality of such a process in the US. The Yes Campaign, while outlining the legal intricacies involved in secession, states on its website: "Although the path to seceding from the Union is a long and difficult journey, there are multiple legal paths for this campaign to succeed." It asserts that while its true that in 1869, the US Supreme Court in Texas v. White, ruled that states cannot unilaterally secede from the Union, it did not specifically deny the possibility of such a move. "Indeed, there is no specific ban on state secession in the US Constitution, even though that document does discuss states in Article IV," states the Yes Campaign. Article IV of the US Constitution states: "New States may be admitted by the Congress into this Union; but no new State shall be formed or erected within the Jurisdiction of any other State; nor any State be formed by the Junction of two or more States, or Parts of States, without the Consent of the Legislatures of the States concerned as well as of the Congress." The Yes Campaign draws attention to a gap in the Article. "Clearly missing from that paragraph is something to the effect of, "nor shall any State be expelled, or be permitted to withdraw from this Union". The campaign interprets this lacuna as the intent of the founders to let the Congress handle such issues of statehood. And it quotes the Supreme Court in Texas v. White to buttress such an interpretation. "When Texas became one of the United States, she entered into an indissoluble relation. The union between Texas and the other States was as complete, as perpetual, and as indissoluble as the union between the original States. There was no place for reconsideration or revocation, except through revolution or through consent of the States." So what's the way out? 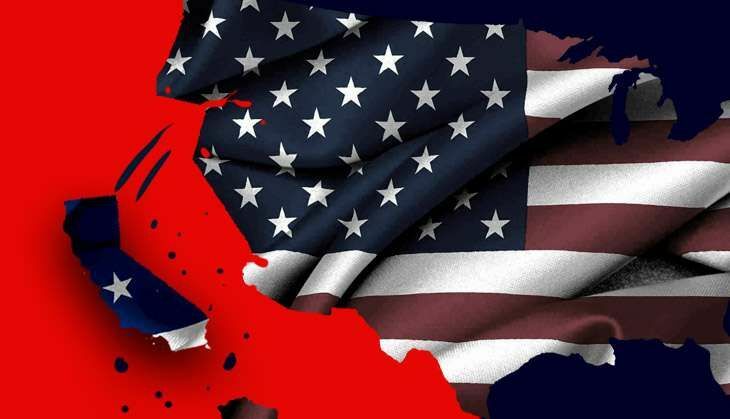 A member of the California federal delegation to Washington would propose an Amendment to the US Constitution allowing the State of California to withdraw from the Union. The Amendment would have to be approved by 2/3 of the House of Representatives and 2/3 of the Senate. If the Amendment passed it would be sent to the fifty state legislatures to be considered (to satisfy the "consent of the states" requirement in Texas v. White). It would need to be accepted by at least 38 of the 50 state legislatures to be adopted. California could call for a convention of the states (which is currently being organised to tackle other constitutional amendments as we speak) and the Amendment granting California its independence would have to be approved by 2/3 of the delegates to this convention. If it passed, the Amendment would be sent to the fifty state legislatures to be considered and 38 of the 50 states would have to approve the measure in order for it to be adopted. As Trump prepares to formally move into White House, and his anti-immigration rhetoric, it seems, could well translate into action, one of the appeals of the Yes Campaign cannot but strike a chord among Californians. Highlighting why California needs to secede, the campaign argues: "California is the most diverse state in the United States and that is something we are proud of. This diversity is a central part of our culture and an indispensable part of our economy. As a US state, our immigration system was largely designed by the 49 other states thirty years ago. This immigration system has since neglected the needs of the California economy and has hurt too many California families. Independence means California will be able to decide what immigration policies make sense for our diverse and unique population, culture, and economy, and that we'll be able to build an immigration system that is consistent with our values."